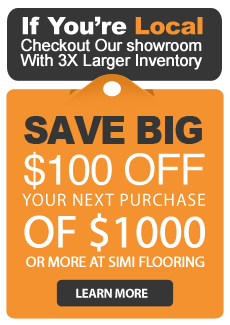 Simi Flooring offers free local delivery and other shipping options. Shipping & handling charges for catalog and Internet order processing are caluclated using the following factors: item selection, cost of merchandise, packaging, delivery distance and handling. Due to item weight, size, and/or packaging, some items require additional charges. Buy today and we’ll deliver your order for free. Orders of at least $500 and a destination within a 25-mile radius from the store are eligible for free delivery. Customers with suitable vehicles may pick up their orders directly from the warehouse for free. Customers that need flooring shipped beyond 25 miles may pay for standard shipping, calculated according to weight, size and selected service.